Last year, a headline in Forbes: Why Trust is the New Core of Leadership. The old power-based leadership model worked in the past, but as organizations flatten and become more collaborative, the old model is undermining success. Is it time to make trust a priority? 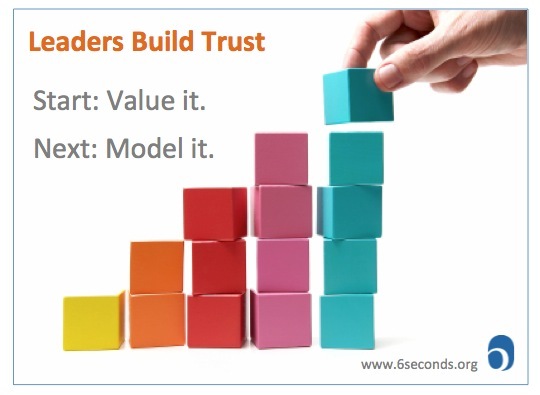 If so, can leaders just “decide” to build trust? How does it work in real business? John Caparella, President of the Venetian resort and an award winning manager, spoke in an interview with Charles Wolfe on PRX radio on how to build trust. When he was opening a new hotel he challenged his HR team to use one abiding rule in every decision they made which was “Do the right thing.” He modeled the behavior he wanted from others by willingly admitting his own mistakes and let staff know that they were better served to self disclose than not. Most organizations punish a person for making mistakes which encourages deception. By creating an environment where it was safe to learn from mistakes Caparella built a team where open communication, honesty, integrity and courage were internalized values. These all build trust. Harry Herington is CEO of NIC. NIC builds official web sites, online services, and secure payment processing solutions for US government agencies. He is recognized as a trusted leader and was featured in the New York Times in an interview about trusted leaders. Instead of asking managers, “Do people trust you?” He asks “How do you know people trust you?” He knows that in order for his leaders to be trusted they have to know what builds trust. He’s pushing them to find evidence to back up their assumptions about trust. Harry is on to something. In a recent survey about team climate, we asked leaders if people trusted them… and we asked team members if they trusted the leaders. Leaders perceived trust to be a full 40% higher than did the team members. There’s a serious misassumption going on, and Herrington’s question would help these unaware leaders get real. In both these cases, a leader made a decision: Trust is an invaluable currency for organizational life. Maybe it’s even THE measure of leadership. So they took action. It’s not about a secret formula, these guys used basic, logical steps to build trust. And it worked. How about you? How committed are you to building trust on your team? What’s the simple, practical step you’re taking to do so? Can trust be learned? Yes! Join me on the next trust blog and I’ll share more of these strategies. Lea Brovedani, The Trust Architect, is the author of TRUSTED: A LEADER’S LESSON as well as the mini-ebook, Rebuilding Trust (on Amazon Kindle).She is a Preferred Partner in the Six Seconds Emotional Intelligence Network, speaking and training on this essential ingredient for building vibrant teams and companies. To get Lea to speak at your event or train your organization, contact us! Trust is the most important factor to build employee engagment. Leaders who lack self confidence would be unable to trust others. Self awarness is very important knowing that your team do not trust you is very important to start the journey of change. What is the biggest “Ah-Ha” you have had about building trust with others? Please share. I may use it in my next blog with your permission of course. Yes I have seen the magic of trust time and again in organisations where my Clients lead. Trust is the very foundation of every relationship. Relationship is between two people and not within either of them. It therefore is the responsibility of both to nurture that relationship from time to time by investing in its foundation i.e. trust. Increase in trust has resulted in decrease in stress. I agree completely that it is both of the clients responsibility to nurture the trust relationship. What is the best example that you have witnessed about nurturing trust? I’d love to learn from you. I love the question, How do you KNOW people trust you?. In my work Trust is critical to success. I see so many “good intentions” and equally as many broken promises. The impact on trust is formidable, and creates a performance malaise rather than activation. Tammy, it’s great to hear your voice in the trust conversation. How do you know people trust you? What do you see? 7 habits of highly effective people by Stever R Covey fantastically explains how leaders can built and retain trust. I personally believe, that inside out approach and win-win attitude can do wonders if leaders can strategically alien these two with their organisational values. Hi Ali, I love 7 Habits and also “The Speed of Trust” written by Steven Covey junior. I’d love to hear of an example of the inside/out approach that you have seen when it is in action. The title should not be Can Leaders build Trust, but Can they afford not to. No-one hands the reins to someone they don’t trust. I agree Peter. Many leaders are not aware of actions that destroy trust and are surprised when they find out that they are not trusted. What do I see when I’m given the gift of trust? It’s a great question. My experience tells me, Opennesss, Honesty, A willingness to say “it’s not okay…or it is”, and a confidence to know the judgement will be replaced by curiosity. …I’m still reflecting. It’s a great conversation. what is important is to start by ourself . High level of self awareness makes the way easier .Who am I ? will open the space to start building the journey of trust with the surrounding. Empathy is the first sign to build the relationship from the start and continue the journey Toward full TRUST. Building trust needs more than 24 hours it is a continuous journey. Jameela you bring up a great point. It starts from within and moves outward and that high level of self awareness helps to understand all the complexities of trust. I believe it was Warren Buffet who said it takes a lifetime to build trust and only minutes to end or damage it. I believe if we live with EQ we can have sustainable trust. Trust is a much overused buzzword, but few people know what it is. Or that there are different levels. The Trust from a promise – will he, won’t he keep that promise – is quite different from the Trust of a relationship – I know whatever we throw at them, they’ll do a good job. Far too many companies rely on the former, when they really need the latter. Thank you for your kind words. It encourages me to write more.